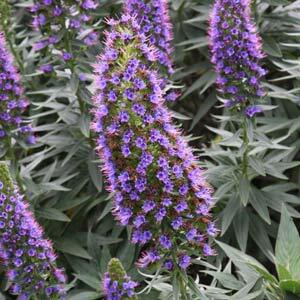 Echium plants are standout landscaping plants, attractive foliage through the year and brilliant flower in season. Bold flowers and attractive foliage make these great feature plants. They add size and height to the garden border and come a number of varieties and flower colours. Excellent plants for attracting bees to the garden, and easy to maintain. Maintenance is easy, simply remove spent flower heads to tidy up and prune lightly to maintain a more compact shape. Echiums do not require much water once established, and do require good drainage. Smaller growing cultivars can be grown in containers, plants make a good feature in the garden border, with taller species being suited to the rear of the garden border if needed. A number of species and cultivars are offered by wholesalers and they do suit use as feature plants as well as for mass planting in commercial and broader landscaping projects. Echium candicans (syn Echium fastuosum) – Also known as ‘The Pride of Madeira’, lower growing with purple flowers and perhaps the most widely grown of all. Echium wildpretii – Very large flowers with spikes to over 5m in height, red in colour and a standout in the garden. Echium plantagineum – A very different form with smaller terminal flowers not widely offered for sale by wholesalers. One of Australia's largest wholesale trade nurseries. Over 30,000 species available, tubestock to advanced trees, an almost unlimited choice of plants. Specialising in propagation and production of over 900 species / varieties of ornamental plants, perennials & rare plants. Supplying nurseries, landscapers & others. Minimum quantities apply! Contact us to discuss plants or growing requirements. Japanese Maple and Magnolia specialists, Wholesale and Retail. Large range of other deciduous and evergreen ornamental trees and shrubs.